Did Russian Jets Violate Japanese Airspace? If true, it would mark the first time that Russia has violated Japanese airspace since 2008. 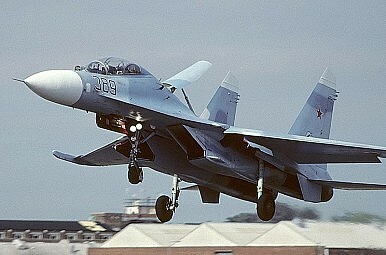 Japan scrambled fighter jets after two Russian Su-27 fighter jets entered Japanese airspace over the territorial waters of Rishiri Island in Hokkaido the Japanese government said on Thursday. “Today, around 03:00 (06:00 GMT), military fighters belonging to Russian Federation breached our nation's airspace above territorial waters off Rishiri island in Hokkaido,” Japan’s Foreign Ministry said, the BBC reported. Japan responded by scrambling two F-2 jets. Russia denied the incident saying it had been holding military drills over the Kuril Islands this week but had not violated Japanese airspace. A spokesperson for the Russian Defense Ministry said, “"Flights of military aircraft are … carried out in strict accordance with the international rules governing air space and do not violate the border of other states,” Yahoo! News reported. Moscow and Tokyo have been locked in a dispute over the ownership of the Kurils Islands since WWII. There have recently been signs emanating out of Tokyo that suggested the Japanese government was looking to finally end the ongoing spat over the Islands. Last month on national television, former Japanese Prime Minister Yoshiro Mori proposed a solution to the conflict that would leave Russia in control over some of the islands. The Abe administration quickly distanced itself from this proposal, however, it has since expressed interest in ending the dispute. If this latest incident is true, it would mark the first time that Russia has violated Japanese airspace since 2008.